If you think of Ducati’s much-loved Multistrada 1200 as being a tall, comfy superbike you can crack serious high-speed miles on, the Enduro version will take you even further, no matter how extreme the terrain. 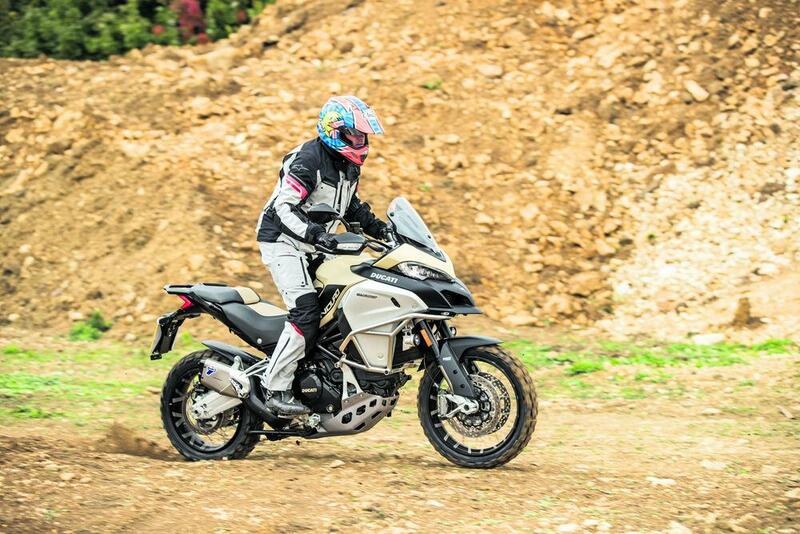 Arriving last year with its plastic 30-litre fuel tank, an off-road-friendly 19” spoked front wheel, knobbly tyres and long travel suspension, there’s no getting away from the fact the 1200 Multistrada Enduro is a heavy, imposing machine. You wonder how you’ll ever master it as you heave it off its sidestand, being careful not to fall off the other side. Long legs are an advantage here. 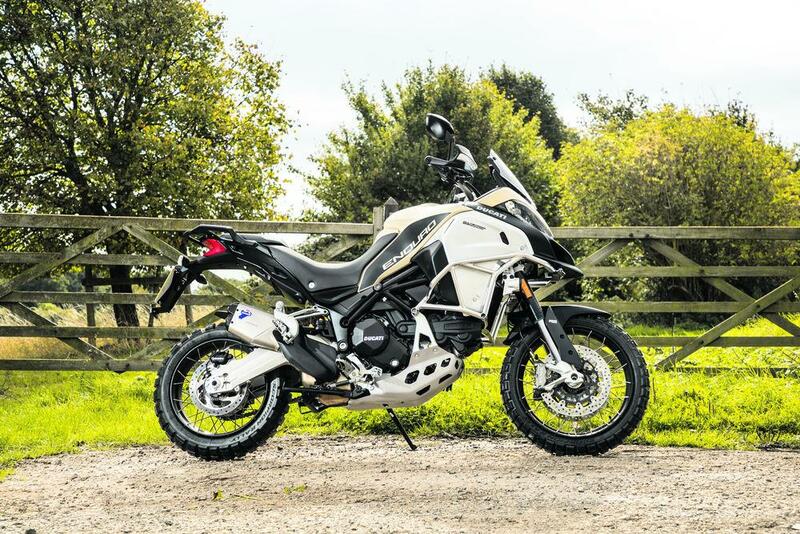 But once you’re moving and that weight has drifted away, you quickly realise the big Ducati can do everything and go anywhere, kicking dirt into the faces of its adventure rivals along the way. And now here’s an even hotter version: the new £18,999 Enduro Pro. The sand-coloured machine costs an extra £1704 over the standard Enduro and for that you get a host of performance and cosmetic goodies: Pirelli Scorpion Rally road-legal off-road tyres, a Ducati Performance titanium Termignoni exhaust can, Ducati Performance tubular steel Touratech tank protectors, a lower (but still manually-adjustable) screen, a two-tone seat, a black-finished subframe, alternator and clutch cover. At its heart the Enduro Pro is still powered by a 152bhp 1198 superbike lump, retuned to give buckets of earth-moving grunt. Like all big Ducati V-twins it’s on the clattery side at low rpm, but past 4000rpm it barks and growls through its fruity new can and will set off into the rocky landscape like a maniac. An immaculate throttle response makes trickling through town, or through tricky trails a breeze, but this Ducati taps you on the shoulder and reminds you of its superbike genes when you open the taps. It’s seriously quick by any bike’s standards, let alone one of stilts with hobnail boots. 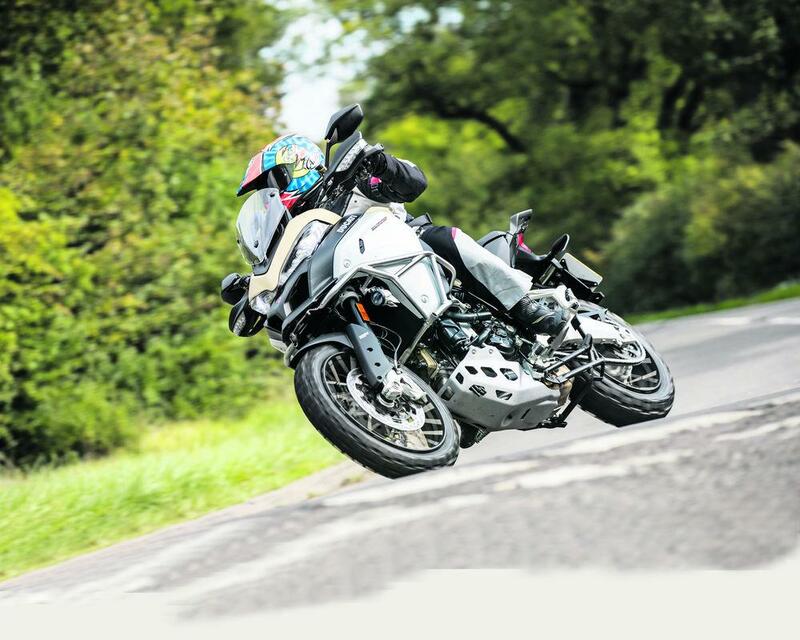 Sport, Touring, Urban and Enduro riding modes change everything from the sharpness of power the amount of traction, wheelie and engine braking control and ABS intervention with a flick of a button. It also adjusts the compliance of the electronic Sachs ‘Ducati Skyhook Suspension’, which doesn’t just have semi-active damping, but preload, too, constantly adjusting, self-levelling and melding the Bologna beast into the road surface.Ride quality is nothing short of exceptional. It’s annihilates bumps and stamps them flat like a DM-wielding African Elephant. You actively go seeking the worst kept B-roads, pot-hole strewn pieces of tarmac and speed bumps just to marvel at the way the Enduro Pro floats over them and imagine what a mess just about every other bike would be getting itself into. With the riding mode switched to ‘Enduro’ the Ducati is even more impressive on the dirt for such a big bike. That clever suspension becomes even more compliant, the power softens and electronics release their grip enough for off-road fun, but will catch you when 261kg of metal and plastic gets too far out of control. Handling is compromised by the 19” front wheel and new Pirellis on the road. It doesn’t roll into corners as consistently as the road-going Multistrada with its 17-incher and needs more steering input to place it exactly where you want. But once you’re leaned-in the Enduro Pro is stable and those tyres give surprising grip, considering how little of their blocky rubber is actually touching tarmac. But you’re glad of the wheel and tyre combo in the dirt and combined with the Ducati’s incredible lightness on it feet, loose terrain seems to turn into smooth, grippy tarmac, loading you with confidence as you pass on by. The Enduro Pro’s velvety cross-country poise is incredible and the immense feel and power of the radial Brembos isn’t too shabby, either. Like all Multistradas, long distance comfort isn’t in question and the Enduro Pro’s wide, imposing face gets traffic to move quickly out of your way. From its plushy-padded seat, to perfectly positioned bars and rubber-topped pegs, the riding position is as relaxing as an afternoon nap. Mirrors are effective, the full colour Bluetooth dash is clear and precise, but with its shorter screen, to suit stood-on-the-pegs off-roading, there’s a fair amount of windblast at high speed. As well as the extra trinkets you get with the Pro, standard equipment is vast. You get those electronic rider aids, cruise control, keyless ignition, electronic braking-enabled ‘hill hold’, cornering LED headlights, illuminated switchgear. But a quickshifter/autoblipper is notable by its absence and despite having a button for heated grips you have to pay £223.08 extra for the actual hardware, which is a bit mean on a 19 grand bike. Just about every adventure bike out there is either cheaper, lighter and more manageable on the dirt, but for sheer cross-continental indulgence, five star ride quality, surprising off-road poise and face-melting speed the new Ducati Multistrada 1200 Enduro Pro is decadently brilliant. With its extreme of-road tyres, fruity exhaust, Dakar-busting bull bars and cosmetic tweaks this Pro version of Ducati’s Multistrada 1200 Enduro is the last word in long distance, off-road opulence. It’ll be too cumbersome for some, especially off-road, those knobblies and 19” front wheel are a compromise on tarmac and it’s not exactly cheap, but if you want the ultimate do-anything, go-anywhere adventure tool, look no further. Suspension: 48mm Sachs forks and single shock. Electronic semi-active preload and damping.